Celebrate Earth Day with Installerstore.com! This blog features just some of our environmentally friendly products offered on our site. Click the links or photos to go directly to that product on our website! Forbo Marmoleum Click Flooring is known for its ease of maintenance, installation, hygenic properties, extreme durability, environmentally friendly properties and lowest life cycle costings. This click flooring is made of natural raw materials including Rosin, Wood Flour, Cork Flour, Linseed Oil, Limestone and Natural Pigments. With 20 colors to choose from, this great environmentally friendly flooring will surely match your decor! Visit our site to purchase color samples of this extraordinary flooring! Bamboo flooring by Mr. Bamboo is an eco-friendly choice for your home, office, or business. Because it is made of bamboo, it contains a large amount of fiber which makes it denser than the average hardwood flooring. Bamboo flooring is durable enough for pets and can be used in basements and radiant heating systems! This pre-finished floating (self-locking system) flooring is harvested from “moso” species of bamboo. This species of bamboo takes only 5-6 years to grow and harvest, compared to traditional oak trees which can take over 30 years to harvest! Mr. Bamboo sustainable and eco-friendly solid bamboo flooring: helping the green movement one floor panel at a time. Environmentally friendly Floor Cleaner and Care products are offered on Installerstore.com! Mr Floor’s Floor Cleaners leave a fresh scent and make a great natural choice for your floor care! Get an environmentally friendly but effective Hardwood Floor Cleaner with the Earthwerks Floor Cleaner. Biodegradable and eco-friendly Mirage Hardwood Cleaner leaves a fresh green apple scent. Green Logic Core Products are Green Seal Certified. Products for tile, hardwood and more! Stone Savior stone care products are non-toxic and eco-friendly. No-rinse formula makes them a breeze to use! Environmentally responsible all natural WoolClean cleaner safe for upholstery, rugs and clothing. Apex Flooraid Plus for ceramic and hard surfaces. Safe for homes with pets and children. Easy on the wallet and the environment! Tech Tile & Vinyl Cleaner is effective and economical. Mohawk Tile & Grout Cleaner is made of 98.5% natural ingredients. Purchase ready to use kit for easy cleaning! Sentinel 840 All Surface Cleaner is biodegradable and has a low odor. Also check out Sentinel’s earth friendly adhesive removers. Stop buying paper towels and replace them with reusable Kalle Cleaning Cloths. Saves you $ AND space in the landfills. Bona brand reusable cleaning cloths are machine washable! Microfiber Floor Cloths and Scrub Cloths available. Check out the other energy saving and earth friendly products on Installerstore! AC Draft Shield is a revolutionary way to save money on your energy costs! This recycled plastic vent prevents drafts by creating a tight air seal on your wall and ceiling registers. We’ve added a new grout choice for our customers: Fusion Pro Single Component Grout by Custom Building Products. This advanced acrylic plus silicone formulation provides superior color consistency and stain resistance. Unlike traditional cement grouts, there is no mixing needed to use this grout. Just pop the top of the bucket, and get to work! This acrylic silicone grout can be used for interior or exterior wall and floor surfaces. There is no worry about shrinking grout with this product, and Fusion Pro grout can be used on grout joints 1/16″ to 1/2″! Available in convenient 1 gallon pails, and any extra can easily be re-used in future applications by just re-sealing the bucket. This easy-to-used sanded grout can be used on counter-tops, tub surrounds, showers and high traffic areas. Fusion Pro Grout can be used on interior and exterior surfaces, but not in areas that will be completely submerged in water, such as pools and hot tubs. It is recommended that exterior applications must be protected from rain, snow and other wet conditions for at least 7 days. Do not use Fusion Pro in industrial applications or areas subjected to harsh or continuous chemicals. In areas exposed to high heat or high pressure cleaning equipment, you also do not want to use this grout. The curing time of the Fusion Pro Premixed Grout will vary when exposed to lower temperatures and higher humidity. A general rule for this grout is 24 hours until light traffic, 3 days at 70 degrees and 50% relative humidity until it should be exposed to water. Covering Fusion Pro immediately after grouting will extend the cure time. Be sure to purchase all of your grouting tools and accessories when you purchase the Fusion Pro Grout on Installerstore.com. Professional grade grouting tools including Foam Knee Pads, Rubber Grout Float, and Grouting Sponge. Your one “click” shop for everything you need for grout installation. We carry other brands of pre-mixed grout. Place 3M Caulk Softener on existing tub caulk and let stand for 2 hours. This wonder bottle can cover 24 linear feet at an 1/8″ bead, so one bottle should do the trick for your tub surround. Once the caulk softener has been sitting for at least 2 hours, remove old caulk with a putty knife or the caulk removal tool that came in the Professional Caulk Tool Kit (shown below). After removing the existing caulking, make sure to clean the area with rubbing alcohol and NOT water, to ensure that you’ve removed all traces of mildew. Let the area dry. Next, fill the bathtub with water before applying new caulk to ensure the strongest seal around the tub. Optional (and recommended): use Seal Rite Tape to keep application straight and neat. First, make sure the area is completely dry to achieve better seal. It is best to apply caulking in temperatures above 40 degrees farenheit. Load caulk tube into a caulk gun and cut tip to 45 degree angle or use tips included with the Professional Caulk Tool Kit. Start first on one of the shorter walls (usually the sides of the tub). When squeezing the trigger, keep moving and always pull the gun in opposite way the gun is pointing (see photo below). Keep constant pressure on trigger and don’t lift gun until you reach the corner. First thing is first, these first products I will be talking about are for re-finishing, meaning you have floors that have previously been finished. Over the years, you may find that your finished floors look dull and have small scratches. Basic Hardwood Floor Refinisher and Bona Hardwood Refresher can revitalize your finished hardwood floors and can even fill in small scratches. The directions are easily for both products, simply clean your floor, apply the Basic Refinisher or Bona Refresher using a synthetic lambs wool applicator pad and let dry. It really is that simple! If your floors have yet to be finished or you have laminate floors, don’t fret! We have products for your situation as well! only. Made from natural vegetable oils. Coverage approx. 400-500 sq ft.
New Year brings new hope, motivation and an overwhelming feeling of needing to get organized, and where to start. Here at Installerstore, we understand your feelings, and are here to help you complete your New Year’s Resolution to keep your home clean and organized. In this blog we will share our easy-to-use cleaning products and tools, and even tips on weekly house cleaning schedules (for all households). I have used ideas and cleaning template found on a blog article “Weekly House Cleaning Schedule” found HERE. For those of us who were not blessed with the neat gene, keeping up with cleaning can sometimes become an overwhelming to-do list or constantly playing cleaning catch-up. If readers take anything away from this blog, it should be this…. “1 Room a Day.” Even if you don’t implement the templates or weekly schedules suggested, if you concentrate on 1 room a day, you’ll considerable cut down the stress that comes along with frantic cleaning before guests arrive. I’ve found that concentrating on just room each day or every other day, it not only eliminates my stress but also helps fight my (and my husbands) procrastination. First and foremost, determine how long you want your schedule to be: weekly, monthly, etc. Next you’ll want to make a long list of everything that you think needs cleaning. You may find it easier to make a list for each room, it is less overwhelming that grouping the house as a whole. Along with the cleaning activities for each room, you can have a complete cleaning of certain rooms weekly/monthly. You can call the less frequent cleaning activities “Deep Cleaning.” For example, you’ll clean the toilet once a week, but the bathroom will get a deep cleaning once every month. The time line for basic cleaning activities (like cleaning the toilet) will vary from household to household. Feel free to determine the frequency of tasks to whatever is reasonable to you. If you have multiple people in your home, such as a college house or if you have children, you can delegate people to tasks. If you are feeling even more compulsive, you can assign specific tasks to specific days. If your son Timmy has sport practices Mon, Tue and Wed, assign his cleaning chores to later in the week. The most important part, is to put it in writing. People (yourself included) won’t remember exact tasks, or if a deep clean has been done this month unless it is documented. Get a household calendar or weekly planner, or better yet use the great excel document that I had found on the Weekly House Cleaning blog entry (there is link to download the excel file under the “How to Use My House Cleaning Schedule Template” section). And lastly, the most important step is to stick to it. And another thing, don’t be too hard on yourself or others if you get behind on your cleaning schedule. You can always squeeze in an extra toilet scrub or scrub twice as hard on the next cycle. There are products and cleaning tools out there that can help eliminate time and energy. These include mops and kits, specific/effective cleaner for any type of flooring, and the best floor cleaning tools out there (even a brush for stubborn grout cleaning). Carpet Aid rug cleaner really works and is cost-effective! Use this rug cleaner on pet stains, wine, food spills, and much more. We also carry Apex Spot Beater Aerosol Carpet Cleaner. Capture Carpet And Rug Dry Cleaner for cleaning small spots and entire carpet. Significant reduction in level of allergens, pet dander, and pollen in carpet fibers. Safe for use around children and pets. Easily clean wool carpet with the Wool Clean Carpet Spot Removal Kit which is safe for all carpet fibers and effectively cleans spots and spills on your wool carpets. Safely clean blood, ink spots, and more with Tech Stain Remover. Safe for use on carpet, upholstery, vinyl, and clothing. Red stains on carpet are history with NilOdor Red-Out Kit. This stain remover kit removes stubborn color stains where bleach cannot be used. Sentinel 810 All Surface Floor Cleaner is great for floor prep and everyday cleaning. This will clean and shine all finished flooring surfaces, such as hardwood, ceramic, stone, and vinyl. Flooraid Plus is a biodegradable cleaner and safely cleans without leaving dulling residue behind. The hard surface floor cleaner is pre-mixed and ready to use. Tech Floor Cleaner will get your floors looking great in no time! This tile spray cleaner is a safe choice. Environmentally friendly, and o.k. to use around kids and pets too. Made in the USA. Neutra-Kleen disinfectant cleaner in commercial and residential settings. The gallon size disinfectant cleaner will kill HIV-1, Herpes Simplex 1 and 2 and more. Hardwood floor oil finish can be intimidating to take care of, but the Bona wood oil floor cleaning kit makes it easy! We carry a full line of Bona Floor Care Products. Lamanator Coatings laminate floor cleaner, restorer and deep scrub will have your laminate floors looking new! Gallon or 32 oz sizes available. Use a new residue free, no wax Bruce Floor Cleaner to make your floor look its best. Safely clean laminate and no wax, urethane finished hardwood floors leaving them residue free. Wicanders Cleaner for daily use. Power Strip removes years of dirt, and Power Polish leaves floors looking new! This floor care system is safe for all Wicanders floor surfaces and cork. Duraseal has made a wood floor wax and hardwood floor cleaner all-in-one. Choose Neutral for light finished woods or Coffee Brown for darker wood surfaces. Clean dirty grout stains with Aqua Mix Grout Deep Clean Spray. Remove unwanted grease, hard water deposits, soap scum, soil, and more! The Mohawk Floor Care Kit has all you need for cleaning grout and tile. Kit comes with 32 oz cleaner, mop, wet/dry pads, and brush. Replacement 32 oz cleaners sold too. Tech Grout Cleaner is great to clean colored grout and other types of floor grout. There are no harsh chemicals or fumes. Tech products are proudly made in the USA. Buy the perfect Ultimate Grout Brush to clean grout. This brush has thick, durable, nylon bristles to easily clean floor grout. Need something smaller? Try the QEP Grout Brush. Remove mildew, grout stains, and restore original grout color with the R-Teez Stain Eraser. Clean grout without using any chemicals. Made in the USA. Use the Sonic Scrubber on hard to clean surfaces in kitchen, bath and more! Battery-operated and water tight with four interchangeable oscillating brush head choices. Effective multi-purpose Aqua Mix Aquakleen removes grease, dirt, and grime from grout joints/other surfaces in home. Use on stone, porcelain, ceramic, grout, glass, plastic, and metal surfaces. Stone floor cleaner by Stone Savior, is a no-rinse, non-toxic floor cleaner for your natural stone surfaces. This non-toxic floor cleaner is also effective for shower floors and walls. Rock Doctor Granite Cleaner is a natural stone cleaner spray safe for all stone. Granite Sealer and Polish also available. BUY NOW! $2 Manufacturer Mail-In Rebate. Wools of New Zealand brand WoolClean Spot Removal products were featured in the November issue of Real Simple Magazine. The article, “Oops, I did it again. Don’t let holiday spills mess with your spirit. Here are solutions (and soaps and sprays) for every seasonal stain” recommends using the WoolClean Spot Remover Kits on wool rugs with stains from greasy gravy to tree sap. The 3 products mentioned in the article, Wool Clean Spot Remover 1, Dry Spot Remover 2 and Absorb-It Powder are available in an all encompassed kit. This stain buster is made specifically to clean wool rugs and carpets, but is safe for all carpet fibers. The 3 Step cleaning process can tackle any spot and spill on your carpet. Use WoolClean Absorb It to absorb spills initially or as a final step to absorb as carpet dries. Also can be purchased separately from kit. **Use On: Pumpkin Pie, Red or White Wine, Coffee/Tea and Cranberry Sauce stains. **Use On: Gravy, Butter or Salad Dressing, Candle Wax, Coffee/Tea, Candle Ash/Fireplace Soot and Tree Sap stains. **Use On: Red or White Wine and Pet Accidents. **Holiday Spill solutions recommended in Real Simple magazine. Some spills require the use of multiple kit items. Please see included step-by-step instructions before cleaning up spills. Check out the November issue of Real Simple on stands now for a full list of Holiday Spill cleaning tips. For our full line of carpet cleaners, browse this link: http://www.installerstore.com/Carpet-Cleaner.html. ****UPDATE 2013: If you missed the November 2012 issue and want to read the excellent stain removal recommendations, click the photo below or visit this link to read the article in its entirety: http://www.realsimple.com/home-organizing/cleaning/stain-removal/stain-removal-00100000089255/index.html. Installerstore has recently added on to the Made in the USA TECH stain removal product line. We not only carry the popular multipurpose TECH stain remover that can be used on carpet, vinyl and clothing, but now also carry stain remover and cleaning products specifically for wood, tile, stainless steel and grout. Now you can properly tackle the ink stains on your carpet and grease stains on your countertops. Have a smelly garbage can? Did a skunk make your yard his home, and now everything REEKS of him? Then you NEED the product TECH SKUNK-X which is an effective odor removal product. This product can also tackle odors caused by cigarettes, feces, urine, perspiration, lockers, garbage and MUCH more! Below is a table of the new TECH product additions to our site. Click on the photo to go directly to the product page on Installerstore. in one! Even can be used on stainless steel! Tech Tile & Vinyl Cleaner. Use on walls, floors and countertops! THE odor removal product! Remove skunk, cigarette, urine, feces, garbage odors from carpet and more! Made in the USA carpet cleaner spray. 100% biodegradable. Non-toxic grout stain cleaner from TECH. No harsh fumes, so great to use in the shower! We still carry the classic TECH stain removal products : Multipurpose TECH stain remover and the popular TECH red wine stain remover. for carpet, clothing and upholstery. Convenient 2 oz spray size. UPDATE: As of 3/5, Pergo floor cleaner has been discontinued by the manufacturer. They now recommend the Performance Accessories Hard Surface Cleaner for the routine maintenance of Pergo Flooring. Find this cleaner at a GREAT price HERE. Return of the Pergo Floor Cleaner to Installerstore! Purchase the popular and very much missed, Pergo laminate floor cleaner at Installerstore.com! This ready-to-use 32oz spray is specifically developed for cleaning Pergo laminate and other hard surfaces, making it THE best way to clean your Pergo floors. This 32oz Pergo floor cleaner is ideal for daily cleaning with a Microfiber mop. Sweep, dust mop, or vacuum your Pergo laminate floors. Spray the Pergo floor cleaner directly on your floors. It works best to clean smaller areas at a time. Wipe clean with a soft clean white cloth or microfiber mop. Pergo premium laminate and hard surface floor cleaner should not be used on wax finished floors. This Pergo floor cleaner is made in the USA. Purchase the floor cleaner from our site Installerstore.com and save with the coupon code 4blog11, so stock up on Pergo laminate floor cleaner. Recently ConsumerReports.org published a blog about easy home improvement ideas entitled “Five ugly home flaws that you can easily fix.” This great article included do it yourself home improvement ideas to look for when viewing a house your are interested in purchasing. These easy home fixes can also be carried over to your own home for inexpensive updates. Installerstore.com also has some great do-it-yourself products that are easy and inexpensive. 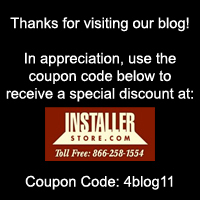 Below are some excerpts from the article and some ideas we at Installerstore have as well. If you pull up the carpet and find hardwood that just needs a little TLC or have other hardwood/laminate floors that need repair, we have great hardwood and laminate repair products, including the brand Trade Secret. There are many different wood and laminate repair kits to choose from, and each one is easy to use and inexpensive. We even carry a product to fix the scratches and gouges in wood and leather furniture. If the kitchen ceramic tiles are loose, don’t worry about replacing the entire flooring. Try fixing the loose tiles with Colorfast Brand Loose Tile Repair. This product comes in a 10.3 ounce tube (like a caulking tube) and the only tools you need is a standard caulk gun, 1/8″ masonry drill bit and rubber mallet (it helps to have a shop vac to clean up too). This easy home fix is inexpensive and can be done on a rainy sunday afternoon. Is the tile ok but the grout unsightly with stains? Purchase grout colorant pens to easily re-color grout and prevent future mold. The solution contains both pigment and an anti-microbial sealant to prevent mold and mildew staining. There are 20 colors to choose from, and each pen is less than $10. The article “Five ugly home flaws that you can easily fix” is a great read for those looking to purchase a new home or easy do-it-yourself home improvement ideas. Visit this link to read the article in its entirety. If you have an antique fragile rug or tapestry that you would like showcase, Zoroufy makes beautiful tapestry wall hangers that can make that happen. It can be intimidating to browse all of their collections- so many lengths, finishes, and finials OH MY! But have no fear, Installerstore Blog is here! I will try to cover the basic information you’ll need to know before browsing and helpful walk through on all of the Zoroufy Tapestry / Rug Wall Hangers, so you can find exactly what you are looking for in your price range. What Does a Rug Wall Hanger Do? A tapestry wall hanger usually consists of a rod cut/adjusted to the width or so of your tapestry (explained below), decorative finials for the end of the rod, a various amount of wall brackets and/or clips- all in your very own chosen finish (color). This enables you to showcase your favorite family heirloom tapestries or antique persian rugs. The most important information you can have before browsing tapestry wall hangers…. To find the correct rod length you’ll need, take the width of your tapestry and add 1 1/2″. For example, if your tapestry is 36″, you would want your wall hanger to be 37 1/2″. Most stair rod collections come with base sets and add-on sets, the collections will not come in exact sizes you need. You can have them custom cut to the size you need for no additional cost (they do become non-returnable) or cut them yourself with a hand saw. If you don’t want to take the chance with cutting, order the Zoroufy Legacy Collection, which has an adjustable rod so you can adjust the rod to the exact length of your tapestry. If you are worried about the weight of your rug, don’t be. Zoroufy tapestry rods and wall brackets are very sturdy and can hold about 10 pounds of rug weight per foot. All collections but the Grand Regency come with the standard clamp clip design (see photo below). None of the Zoroufy clamp designs will harm tapestries, but if you have a very fragile rug or the thought of clips on your tapestry makes you worry, you may want to go with the Grand Regency collection, which has a rotating disc with a gentle design (see photo below). Zoroufy offers 4 diverse collections of tapestry wall hangers. Each collection differs in rod diameter, lengths available, finishes, finals, and clip styles. With bigger rod diameters and different clip styles, collections will differ in prices. The brilliant but basic Classic line will be less expensive than say the Grand Regency line, which has a larger rod diameter and safer clip design. It may be daunting to view all the collections at once, so below is a chart of the different Zoroufy collections, and what each has to offer. Think you’ve found your dream Tapestry Hanger? Click the photo of your favorite collection below, to view pricing on our site. Looking for solid cast floor registers or decorative stair rods? Or how about a beautiful wood baseboard register? The Zoroufy quality carries over into these products as well. Revamp every room in your house! Summers may seem to be full fun opportunities children, but for some parents, finding activities to fill their children’s time becomes a daunting responsibility. Below are some very easy crafts for kids using decorative waterproof tile transfers. Our site (Installerstore.com) has beautiful tile transfers that can be used on ceramic tiles, mugs, mirrors, windows and other smooth hard surfaces. This opens up endless opportunities for you and your children to spruce up their bathroom or make special personalized mugs for their very own use. Below are just some of the simple summer kid crafts you can do with your children using our waterproof tile transfers. One great simple kids craft activity involves making a personalized mug or cup for each of your children and their friends. Have each child pick their favorite Kids Decal Image or any Waterproof Tile Transfer, their favorite mug (must be a smooth hard surface) and a permanent marker (black usually works the best). 2) Peel off the selected tile transfer from the wrapping. 4)Smooth down the transfer on the mug. Make sure to smooth out all air bubbles and bumps. 5)This is the transfer completely smoothed out. 6)Carefully peel back the plastic wrapping. The image should stay on the mug, if it doesn’t, put the plastic back down and smooth down the area once again. 7) The last step is writing the child’s name on their mug, or depending on their age – have them write their name. Children love adding personal touches to their spaces. White tile bathrooms work perfect for our Waterproof Tile Transfers. Letting children put the Kids Bathroom Decal on tiles by the tub may make bath-time go much more smoothly (no guarantees but it can’t hurt)! 1)Make sure bathroom tile is clean and free of any mildew or soap scum. 2)Peel back the chosen waterproof tile transfer. 4)Smooth down tile transfer and make sure to smooth out all bumps and air pockets. 5) Peel off the plastic wrapping. 6)Make sure to slowly peel off the plastic. The images should stay on the tile. 7)The finished image is vibrant and waterproof! And the tub is ready for bath-time! Installerstore.com also has many waterproof tile transfers for other areas of your house, including bird, flower and other decorative images. A “stair rod also commonly referred to as a carpet rod, is an ornamental decorative hardware item used with carpet runners (also known as [ stair runners]) on steps” (thank you Wikipedia). Stair Rods are for decorative use only, which means you’ll need to properly secure/install the carpet runner first. The first thing to think of when in the process of choosing a stair rod, is to know what length of rod you need. Measure the width of your carpet runner. Your stair rod must be at least 1.5″ longer than the width of your stair runner. For example, if your runner is 32″, you would need to order a stair rod that is 33.5″ long. Don’t be concerned if you don’t see that exact length listed, we can custom cut any stair rod for FREE (they will become non-returnable however). Installerstore offers many different Zoroufy collections of stair rods to match any home decor. There are multiple styles, finishes, finial choices, rod diameter, rod style and lengths to choose from. All finishes will have a protective lacquer coating to resist tarnishing. Stair Rods are sold in sets. Each set has (1) rod, (2) brackets and (2) finials. All pieces will have matching finishes. Finials are decorative pieces that are screwed directly into the brackets. This gives the stair rod a more decorative, less industrial look. The overall length of the finial depends on the type, ie pineapple, round etc. Prices of stair rods vary from collection to collection. Zoroufy Grand Regency stair rods are more expensive than say the Select Stair Rods because of the decorative brackets and larger rod diameter. It may be daunting to view all the collections at once, so below is a chart of the different collections Zoroufy offers, and what each has to offer. Think you’ve found your dream stair rods? Click the photo of your favorite collection below, to view them on our site. Don’t forget to call your order in for special pricing! Our phone number is 866.258.1154 and we are in the office M-F 8:00-5:00 CST. Looking for a Tapestry/Rug Hanger as well as stair rods? Or how about heavy cast decorative floor registers? The Zoroufy quality carries over into these products as well. Squeaky floors can be an annoyance to everyone in a household. I grew up in a very old home, and it was impossible to sneak in past curfew. It didn’t matter if I tiptoed on the carpeted hallway or the upstairs hardwood floors. If I only knew about the squeeek no more products back then! To use these products, you don’t need advanced knowledge in carpentry or flooring, you just need to know how to use a power drill. Easy enough right? These products work on hardwood, linoleum, vinyl and carpet floors and stairways. There is a main Sqeeek No More Kit that is used on top of the flooring and a Squeak Ender II which eliminates squeaks caused when the subfloor becomes separated from the joist. The traditional Squeeek No More Kit requires the use of a power drill, but comes with everything else needed to stop your squeaky floors. Each kit includes a driver bit, joist finder, alignment and depth control fixture and 50 specially scored waxed screws. Below are the instructions for the main Squeek No More Kit (which can be used on carpet, vinyl/linoleum and stairs) to show you how simply the product line is to use. Step 1: Located the floor joist, using the Joist finding screw provided. Then, push the Alignment and Depth Control Fixture firmly into the carpet. Step 2: Place your weight around the fixture, and drive the scored screw down as far as the fixture will allow it to go. Step 3: Place the screw gripper, on the alignment fixture over the screw head, then rock the fixture left to right snapping the head off. The screw breaks at the weak spot that is consistently just below the surface of the floor. For use with mainly hardwood floors, try also purchasing the Hardwood Floor Adapter. This works great for hardwood floor areas where you cannot access floor joists or if you have engineered floor joists. Think of this blog as a “sign” to fix those pesky squeaky floors. Or if you are a over-protective father who wants to ensure his daughter is home for curfew (like mine), leave the squeaks be. We do not sell squeak enhancer products :). What is Grout? What is Caulk? Grout and caulking are commonly used in the same household rooms and available in the same colors, but this is where the similarities end. Don’t be bashful if you have trouble deciphering between the two, most do. The following information may help push you into the right direction before you dive into a bathroom remodel or other D.I.Y.’ing. What is grout used for??? “Grout- a thin, coarse mortar poured into various narrow cavities… to fill them and consolidate the adjoining objects into a solid mass.” In layman’s terms, grout is used to fill the spaces (tile joints, grout lines) between ceramic tiles and wall tiles. It has a cement like look to it, and helps keep the tiles in place. It should really only be used between 2 surfaces of the same type. There are two kinds of grout: sanded and unsanded. It can come pre-mixed and in a ready-to-use bucket (like the Bostik QuartzLock2 bucket shown below) or a powder form that must be mixed with water before it is used (see custom building products grout sack below). What is caulking used for? 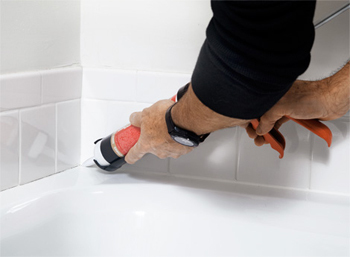 Caulking, unlike grout, can fill the gaps between different types of products and has a bit of flexibility to it.It is used mostly in areas where water is constantly present, to seal a crevice or area from the moisture. Areas where you will commonly see or use caulking would be the 90 degree angle where the tub meets the bathroom flooring, back-splash in bathrooms and kitchens, and where a vanity or sink meets a tile wall. Some people even use caulking on the edges of windows to waterproof. The most popular area to use caulking would be the shower/tub. Below is a picture to show you the main areas you will find caulking and grout. Caulking traditionally is available in a 10.3 ounce cylindrical tube that ia used in a caulking gun. You can also purchase them in smaller squeeze tubes (I would not recommend this for large areas of caulking that need to take place.) Caulk, like grout, comes in sanded and unsanded. Sanded caulking will literally look like sand has been mixed into the caulk, giving a textured look. Unsanded caulking, on the other hand, will have a smooth appearance. Where can I find Grout and Colored Caulking? Powder form grout can be found at most hardware stores from manufacturers such as Custom Building Products, Laticrete, and many more. Ready-to-use grout, such as the manufacturer Bostik, can be found here on our site. The biggest road block people usually have when it comes to colored caulking, is matching it to their grout/tile/etc. There is a manufacturer named Colorfast Industries that we carry on our site, that matches caulking to most major grout lines. If you have Custom Building Products color Driftwood grout, we have a caulking to match! Clueless about which color you want? 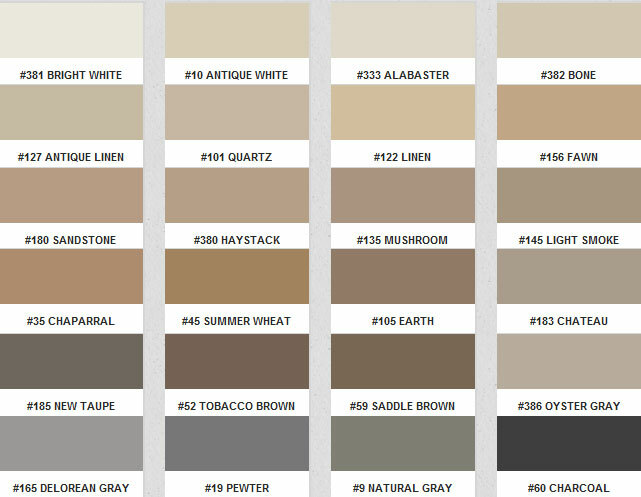 Request color charts so you can view the full color line of caulking. This way you can find a caulking that suits you and your room scheme. After you wake from the sugar coma and throw out the pumpkins (before you forget and leave them out until spring) you may find the little trick or treaters left you a treat in your house…. Dirt. The little feet of the doctor, transformer, and batman tracked in dirt, leaves, and… GUM!! Before you swear off Halloween and post “Trick or Treaters Prohibited” (trust me, the results are bad) here are some easy and affordable cleaning solutions for most flooring types. Also, advice for next year so the Halloween horrors do not follow you into the next day. Maybe you’ll rethink having trick or treaters step into your front door and onto your carpet next year. With a bowl full of sugar being held in front of them, no child is going to think of wiping their feet. For dirt, sucker stains, face paint and even gum, i would recommend cleaning your carpet or rugs with Host products. It’s a tough product but gentle enough to use on wool, sisal and other delicate oriental rugsThe best bet is to purchase the Host Carpet Cleaning Kit, because they contain everything you need to tackle tough stains. If the spill/stain is dry, use a bit of the included carpet cleaner. Then, you just need to sprinkle on the Dry Carpet Cleaner and brush the area in all directions. Once it is dry (I usually wait about an hour), you can just vacuum the area. I’ve seen many people brought to tears talking about damaged done to their hardwood floors. If there is gum or other really sticky hard residues on your hardwood, you’ll have to take great measures of care when cleaning. This tip below is something my mom taught me, which means it’s absolutely 100% true (just kidding). Always take care in trying this out in a small area first. Situations vary. Take ice cubes and place them into a plastic lunch bag. Place the bag with a kitchen rag (so the ice doesn’t melt onto your floor). Place the bag on top of the chewing gum or stick mess and let it sit for a while. The main goal is the completely harden the gum. Once the gum has hardened, take a butter knife or paint scraper and pull up the gum. You may need to re-harden the gum as you work to make sure it pulls off easy. Next, clean the area with your normal hardwood cleaner (such as Bona or other hardwood floor cleaner) to remove any residue. You may need to use a small amount of floor polish if you caused any scratches or marks in the floor. For really sticky stains, try using an Oops product. The easiest of their products is the Multi-purpose remover in an aerosol can. This can be used on vinyl, laminate, furniture, concrete, fiberglass, metal, glass, Formica, and more. Because this is a chemical based product, please take a moment to test it in inconspicuous area first. Otherwise the Halloween Hell might continue. Only 364 days until the next Halloween…. To prepare for the next Halloween, you may want to purchase some type of flooring protection for the inside of your door. Whether it be a vinyl carpet runner or waterproof flooring protection. Protect your flooring investment from the lil monsters. If anyone as any Post-Halloween Horror stories or tips to share, please do so!! Everyone have a Safe and FUN Halloween! The purchase of stainless steel appliances and surfaces is on the rise. The material can be resistant to corrosion if it is kept clean of dirt and grime. Normal household kitchen cleaners will not work for cleaning the stainless steel. Many of those cleaners contain abrasive elements as well as chloride or hydrochloride, which can discolor stainless steel. Make sure to read labels on all products you are thinking of using. The old school method of warm water and a soft cloth can be used as a routine way to clean, but you will need an alternative option for fingerprints (one of the biggest complaints with stainless steel) and tougher stains. You can also use a glass cleaner or household ammonia for the fingerprints, but make sure to rinse and towel dry. If you are looking for a safe-yet-will-take-care-of-stains cleaner, Bona Professional Stone, Tile and Laminate Cleaner may be a great option for your household. Bona products are waterborne, environmentally responsible cleaners. Which means this will work great if you have children or pets. They are non-toxic, nonflammable, pH neutral, and are Greenguard certified for Children and Schools. Not only can you clean your stainless steel surfaces, but you can also use it for laminate flooring, ceramic, tile, vinyl, sealed marble, and sealed granite flooring. Making this your go to cleaner for kitchen surfaces. I can provide you with more MSDS lingo about viscosity and density, but from the over-protective-of-her-dog consumer perspective of this product, I would go with no other cleaner for bathroom and kitchen surfaces. Always use a soft cloth when wiping down a stainless steel surface and wipe in the direction of the polish line. Microfiber cloths work well in this situation. As with any cleaner used in any situation, test in an inconspicuous spot. And you may want to rinse the surface with water and towel dry. Do not let water pool on the surfaces, it will discolor the stainless steel. If there has been a major stain to the steel, scratching, or it needs polishing, you may want to go with an industrial cleaner made specifically for stainless steel. The will be a powerful cleaner/polish, so make sure you read the directions carefully and as always, test on an inconspicuous area. RINSE and thoroughly towel dry. Most retail locations where you buy your stainless steel appliance or surface will have great advice on what type of polish/heavy-duty cleaners to use. Don’t be afraid to give them a call. I would not use these cleaners as a routine cleaner. They usually are pretty smelly and full of chemicals. You don’t want to air out your kitchen every day. As with every post we have, these are just suggestions. If you advice to share on this topic, please do not hesitate to share! Pre-molded corner production of Johnsonite wall base is done on location at our warehouse. We offer pre-molded inside (in) and outside (out) corners in 1ft (12 inches) lengths. This differs from most companies, who traditionally only offer 4″ lengths. The larger length of pre-molded corners allow for easier adjustment during installation so you can square up to the other sides of Johnsonite wall base. The pre-molded corners are available in standard Johnsonite cove base heights of 4″ and 6″, thicknesses of .080″ and .125″. Unlike other companies who offer Johnsonite wall base pre-molded corners, we do not have minimum order quantity restrictions. You have the freedom to order the exact amount you need. The videos below show how our craftsmen carefully and precisely make the pre-molded corners.